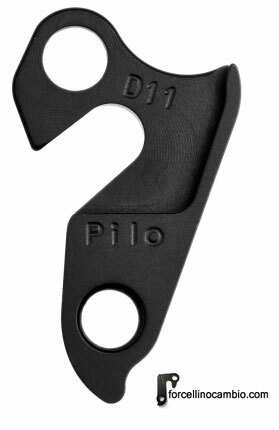 Derailleur Hanger for Kona bikes. Kona 120 2010 derailleur hanger 6061 T651, made with CNC technology. Black anodized. Lighter and more durable than the hanger series. Kona Abra 2011 derailleur hanger 6061 T651, made with CNC technology. Black anodized. Lighter and more durable than the hanger series. Kona Blast 2001 derailleur hanger 6061 T651, made with CNC technology. Black anodized. Lighter and more durable than the hanger series. Kona Caldera 2000 - 2002 derailleur hanger 6061 T651, made with CNC technology. Black anodized. Lighter and more durable than the hanger series. Kona Cinder Cone 2000 - 2002 derailleur hanger 6061 T651, made with CNC technology. Black anodized. Lighter and more durable than the hanger series. kona Coil Air 2000 - 2010 derailleur hanger 6061 T651, made with CNC technology. Black anodized. Lighter and more durable than the hanger series. kona Dawg 2009 - 2010 derailleur hanger 6061 T651, made with CNC technology. Black anodized. Lighter and more durable than the hanger series. Dawgma 2009 derailleur hanger 6061 T651, made with CNC technology. Black anodized. Lighter and more durable than the hanger series. Kona Dew Series 2004 - 2013 derailleur hanger 6061 T651, made with CNC technology. Black anodized. Lighter and more durable than the hanger series. Kona King Zing 2008 - 2009 derailleur hanger 6061 T651, made with CNC technology. Black anodized. Lighter and more durable than the hanger series.